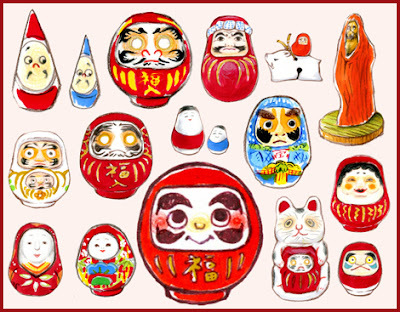 for Papermachee and Clay Dolls !
. 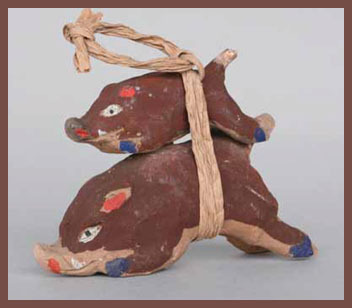 Talismans, Amulets and Folk Toys .
! 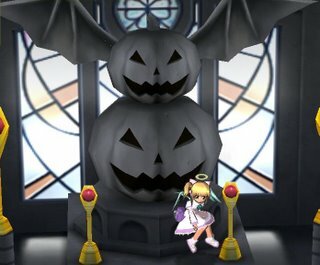 Read the Basics ! Echizen Take Ningyoo . 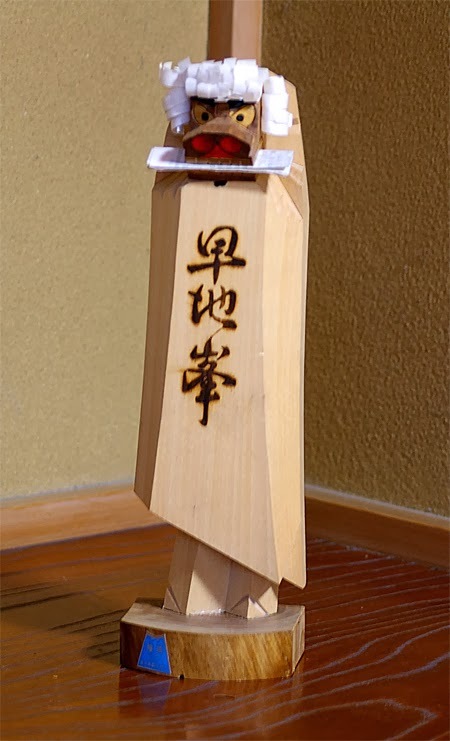 takeningyoo 越前竹人形 Bamboo Dolls from Echizen. 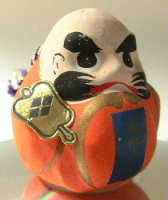 Etsuki Daruma ... 江月だるまこけし Kokeshi wooden doll from Etsuki town, Miyagi pref. Papercraft, Make a Daruma Yourself ! 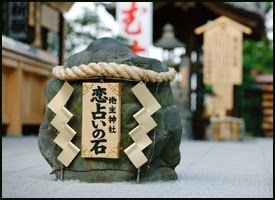 Kooshuu is the old name of Yamanashi Province. 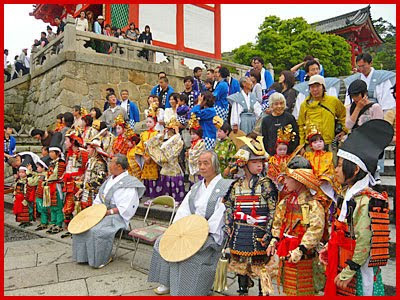 Takeda Shingen was a warlord there during turbulent times before the Edo Bakufu government was formed. 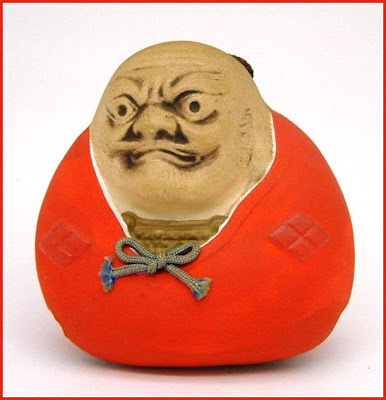 Up to our times he is honored with this Daruma Doll. 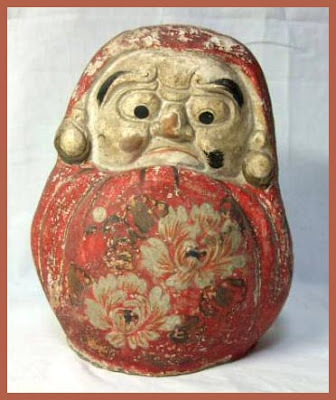 He has the eyes painted in a special way below the eyebrows so when you put him high up on the Gods Shelf in the home (kamidana) he will look down on you and grant your wishes (Shitami Daruma). 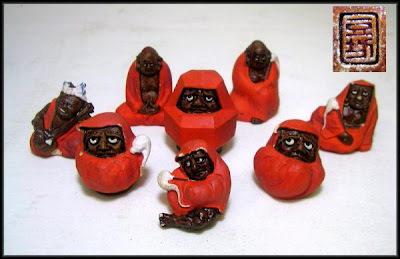 The dolls are also called “Shitami Daruma” or “Yokozawa Daruma” corresponding to the villages where they are made. 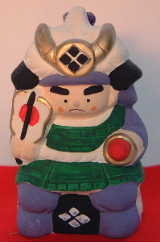 CLICK for more Shingen Dolls. 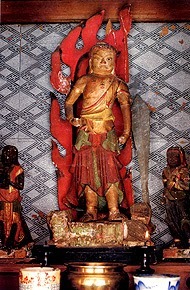 Takeda Shingen was the eldest son of the aggressive warlord Takeda Nobutora (1493-1573). 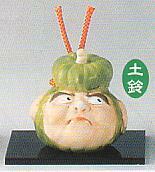 He was Lord of Shinano and Kai Provinces. 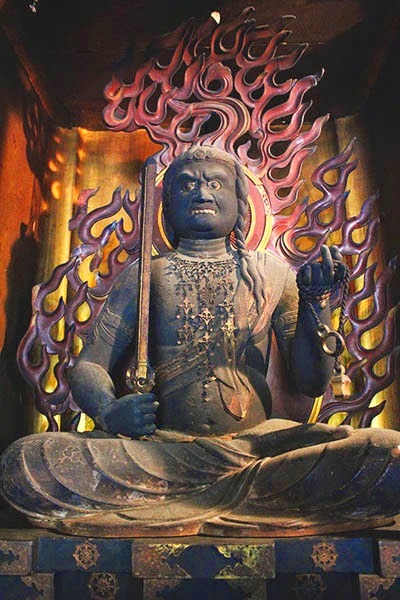 He was a preeminent daimyo or feudal lord with military prestige who sought for the control of Japan in the late stage of Sengoku or "warring states" period. 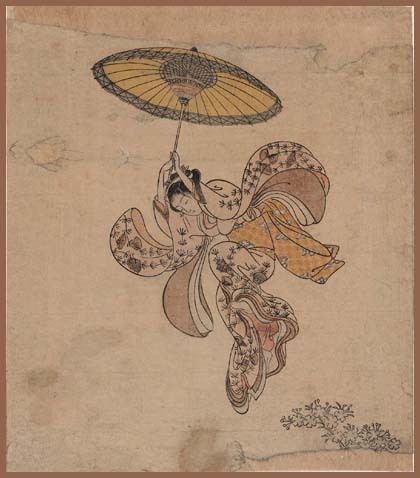 He was born Takeda Tarō (Katsuchiyo), but was later given the formal name of Takeda Harunobu. 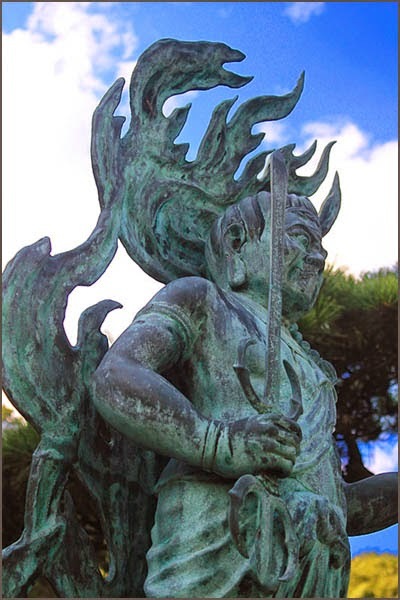 Shingen is sometimes referred to as "The Tiger of Kai" for his martial prowess on the battlefield. 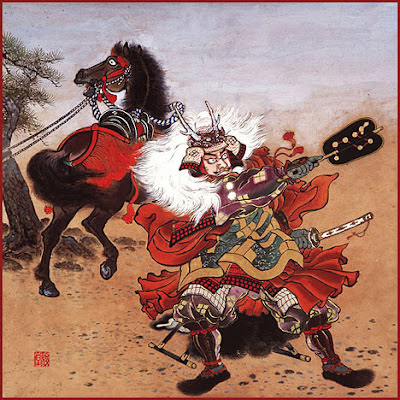 His primary rival, Uesugi Kenshin, was often called "The Dragon of Echigo" or also "The Tiger of Echigo Province". 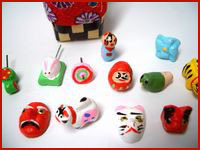 In Chinese mythology, the dragon and the tiger have always been bitter rivals who try to defeat one another, but they always fight to a draw.
. Daruma Clay Bells どれい【土鈴】 dorei .
. Fudo Myo-O　不動明王　Acala　. 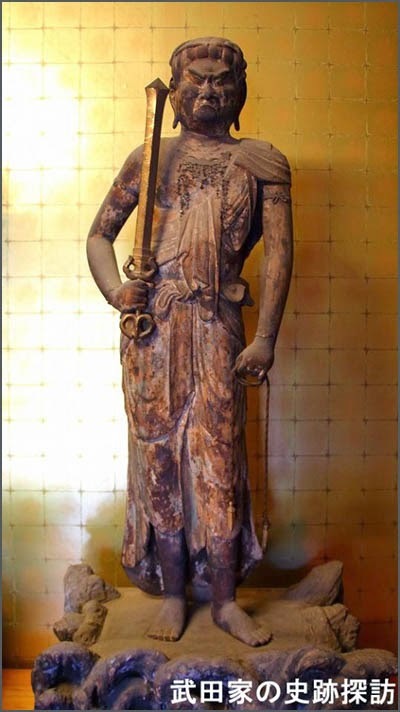 Legend tells us that Takeda Shingen had a few of his own hair cut and mixed to the black laquer for painting the breast of the statue. Erin-ji 恵林寺 is a quiet Zen temple surrounded by the Yamanashi mountains. 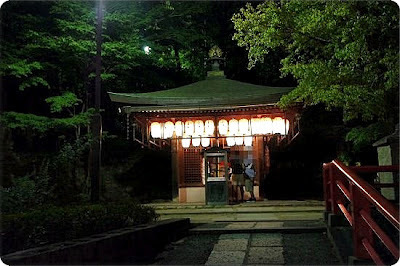 It was built in 1330, when Nikaidō Sadafuji the military governor of the Kai-no-kuni administration asked the Zen priest and garden designer Musō Soseki (夢窓 疎石), also known as Musō Kokushi, to found the temple. 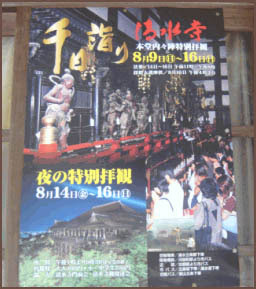 At that time, it was a Rinzai Zen temple of the Engaku-ji branch. 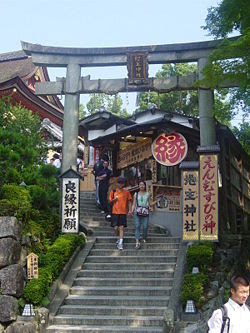 It was destroyed in the Ōnin war (1467-77), but rebuilt when the Takeda samurai clan appointed it to be their family temple. 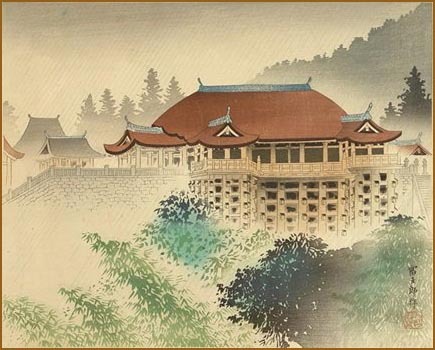 In 1541, it changed to be a temple of the Myōshin-ji branch of the Rinzai school. The famous daimyo Takeda Shingen (武田 信玄) is buried here. 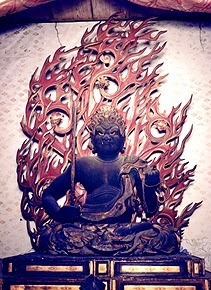 yoroi Fudo　鎧不動 "Fudo in armour"
. Yamamoto Kansuke 山本勘助 . 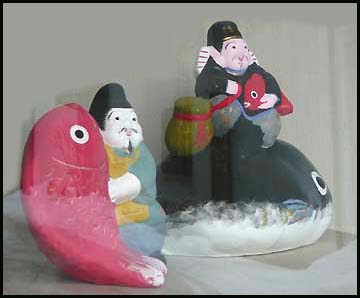 Click on this LINK for a great collection of clay dolls. 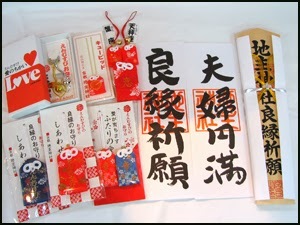 Photos from my friend Ishino san. 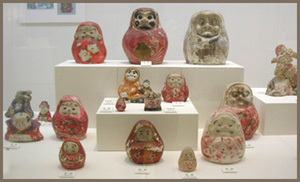 Nakano City, famous as the "country of clay dolls". 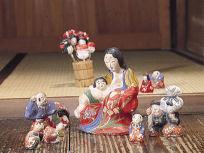 In the museum, standing on the hill with a picturesque view, clay dolls made in Nakano and 1500 other dolls made all over Japan, are displayed. 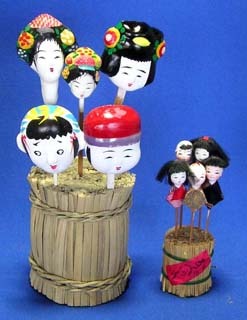 The two families, Nara (from Kyoto, Fushimi) and Nishihara (from Aichi, Tategahana), make these dolls in Nakano. 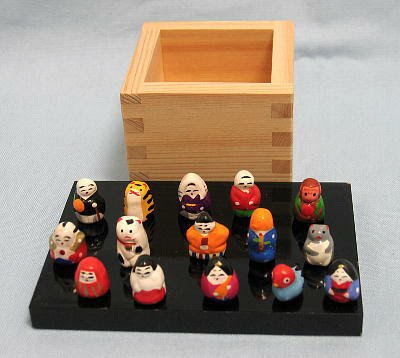 Their repertoir comprizes an Ebisu carrying Daruma doll. 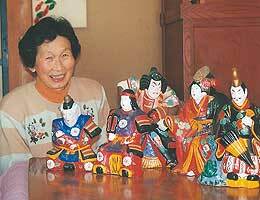 The dolls have been made since about 100 years ago. 西原邦男 Nishihara Kunio was a tile maker and used the clay to make some dolls.
. Nagano Folk Art -　長野県 .